Paint Your Heart Out registration is in full swing. We are close to capacity on some of the 17 workshops we have to choose from this year, running from April 15 to June 1, 2019. Signup soon, and then on Monday, March 25, you may begin inviting non-members to join you in the classes as we will begin advertising to the public. Thanks, again to all the teachers, Rachel Blair, and the Paint Your Heart Out committee, for coming up with a fabulous lineup. Additional thanks to Cherri, Kyle, Wendy, and Denise for making it all possible on the website. Remember, in addition to making our jobs easier with reporting and management, the website purchase process means you have the benefit of a permanent record of your learning experiences on the “My Workshops tab.” This is also a handy reminder if you have forgotten whether, or not, you signed up. Remember to sign in to the website before ordering. In case you’ve forgotten, your username is your first and last name with space between them. Email us by clicking ” here” if you want help signing up. If the workshop you want is sold out, email Rachel at chestnutnews2@gmail.com to be placed on the waitlist. Push Your Plein Air to the Limit! 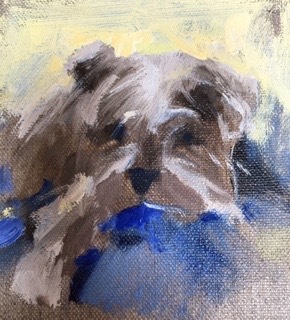 Description: For painters looking to push thru to the next level, Pam will ask participants to send 2-3 paintings images to her 2 weeks before class starts that represent their skill level and will work to help the individuals improve and elevate their paintings. Demo to start. Bring a lunch! Wine and Leiper’s Creek Gallery tour after the workshop. 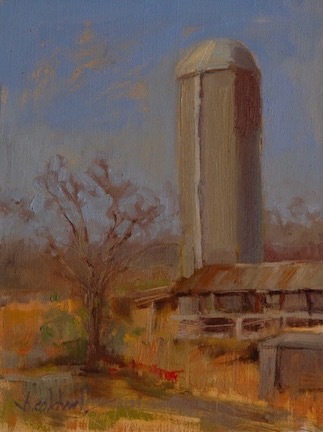 Description: Anne will show you alternative ways to “see” your subject to create simpler, more impactful paintings. Supply list: Drawing pad, vine charcoal, any brand black marker with skinny and fat tips. Portable easel and any plein air paint supplies you already use, i.e. just bring your personal plein air set-up, paints, brushes, turp can, Gamsol, etc. with one or 2 small-ish panels. 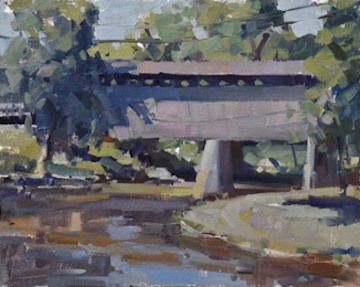 Description: Trey will discuss and demonstrate basic principles for building a plein air painting regardless of medium. 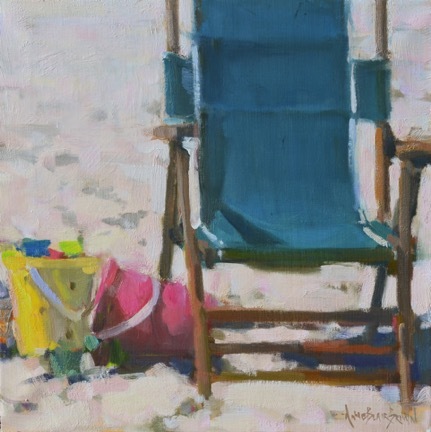 Supply list: Bring your own personal plein air set-up -easel/palette, paints, brushes, etc. and whatever medium you prefer-Oil, Acrylic, Watercolor, Gouache. Description: This workshop will focus on the variety of greens found in the landscape and learning how to mix the many greens found in this area. When do you intensify the green and when do you grey them down? How to use cool green against warm greens, and identify the time of day. To Register, go to: Everything is Green! Description: This class will focus on specific ways to improve your drawing, whether in preparation for a painting or for the pure enjoyment of drawing. The workshop will include a slide show, handouts, short demos and lots of time to experiment with the tools and ideas presented. 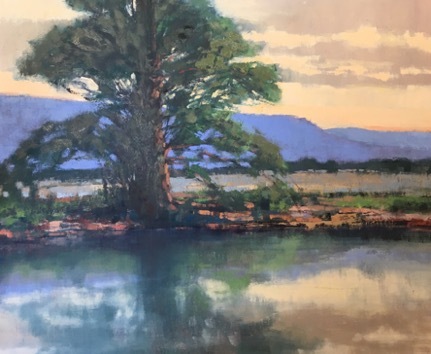 Mike Sowers, a 5 year Chestnut member who paints or draws (almost) daily and can regularly be found painting at Warehouse 521, OnTrack Studios, Southgate Studio (the Factory) and Plaza Art Supply. 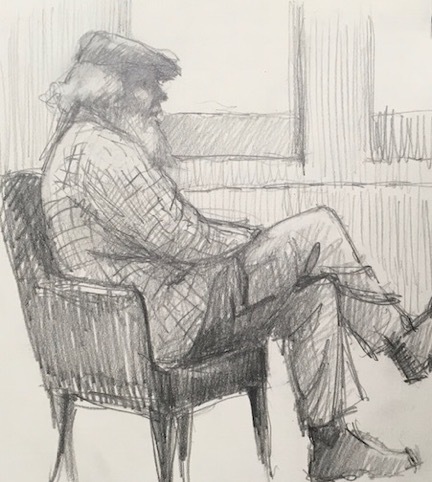 He has had the opportunity to do courtroom sketches for all the Nashville TV stations and NBC Universal over recent years. Description: Join award winning artist and Chestnut Group founder for a day by the water. 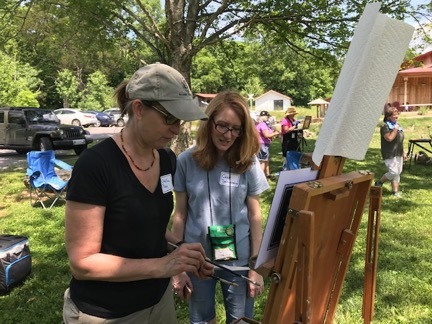 Meet at Centennial Park Wautauga Lake to challenge yourself with this important aspect of outdoor painting. Bring your lunch. Description: In this workshop, Chantel will demonstrate painting a portrait based on a reference photo, while sharing valuable insight into the differences between working from life versus a photograph. Students will learn: what photographs make the best references for portrait painting, editing (what you leave out is just as important as what you keep in), color mixing tips, and how to recognize value patterns and use them. Students will also learn the importance of edges when loosening up a painting. Students may bring their own photographs. Chantel will work in acrylics but both Oil & Acrylic painters are welcome! • Filbert natural white hog bristle brushes in sizes 2, 4, 6, 8, and 10. I recommend and use Silver Brush Grand Prix Superior Bristle Brushes & Robert Simmons Signet Brushes, but other Filberts will do as long as they have a stiffer feel. Brush sizes are not standard among all manufacturers, so I recommend looking up Silver Brush Grand Prix Superior Bristle Brushes online using my above recommendation as guide in order to know what sizes I am using. Masterson’s Sta-Wet palette system (12×16) with sponge & Masterson’s Palette Paper. This simply is a must. Without this system the paint will dry quickly and be difficult to work with. The red lid comes with sponge & paper in it. The blue lid does not include these, so the paper and sponge need to be purchased separately. Liquitex or Golden Heavy Body Acrylic Paints (other brands are acceptable) – Cadmium Yellow Light, Cadmium Orange, Alizarin Crimson Hue, Ultramarine Blue, Titanium White, and N8 Neutral Grey (Golden Heavy Body). It is best to avoid the hues of Cad Yellow Light and Cad Orange but purchase the true color instead. N8 Neutral Grey is a very light grey used in place of white for mixing – this allows white to be saved and used to mix the lightest highlights. Reference photographs (hard copy or electronic). Hard copy can be a 5×7 or larger. Electronic can be on any device other than a smartphone since the image is too small to work from. 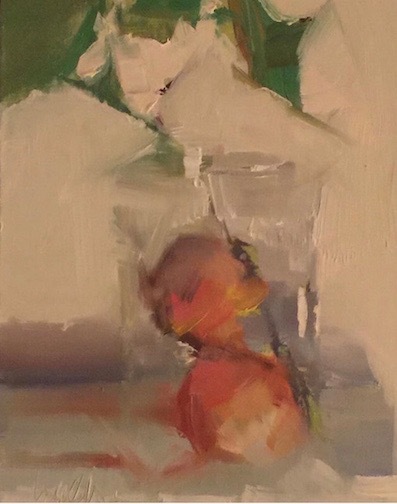 Description: Painting miniature still life in oil will enhance your abilities and your daily painting habits to create expressive little gems, abstracted in light and color. 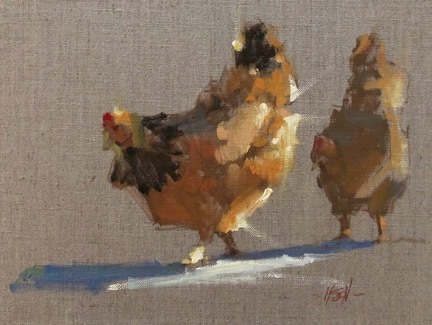 Description: In a stress-free environment, Haden and Marjorie will showcase some of their plein air paintings of cows, chickens, pets, etc., and help to guide students through their own paintings. We’ll be using photos (as most critters are hard to reason with) but will be aiming to capture a very painterly, en plein air feel. Bring your own images that you’ve taken yourself, please, or use some of ours that we will provide. Students will learn, or be reminded, to focus on proper proportions/VALUES/hard and soft edges, and of course, beautifully mixed color! Odorless terp. In a can with a lid. There will be easels provided, or bring your plein air easel. Description: This workshop is for anyone who enjoys the outdoors and would love to capture their surroundings with a brush and paint. 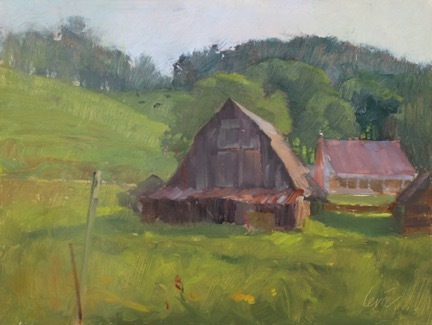 Come join others who are excited to learn and ready to paint plein air for the first time. It is not necessary to have had previous painting experience. This is a good time and place to begin! – Know the best books to purchase to help you along your journey. – Pick out a scene and know how to best compose it. 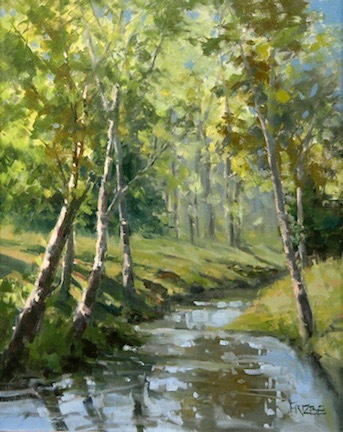 – Feel encouraged to start your next plein air painting. You will also receive an instruction manual describing the basic rules of landscape painting. Description: Learn to build confidence in painting onsite in watercolor. You will learn the fundamental techniques of the medium. 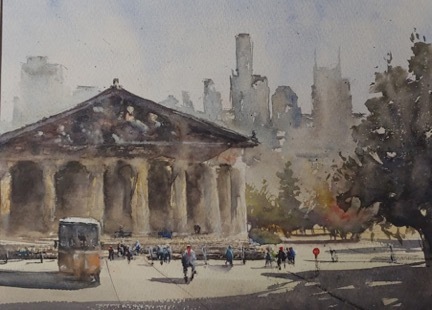 Discover how to interpret and simplify subjects to produce successful urban paintings. Feel free to bring whatever supplies you are most comfortable in using. Items list below are meant as guidelines. Watercolor Paper: loose 1⁄4 sheets (11×15) or similarly sized watercolor blocks. 140lb rough or cold press. Easel: simple lightweight tripod style easel (for plein air work) and board to tape paper too if using loose sheets. Miscellaneous: Masking tape, small water mister, water container, paper towels, hat and sunscreen for outdoors. Description: Organize shape, value, directional angles and color to create paintings with impact. 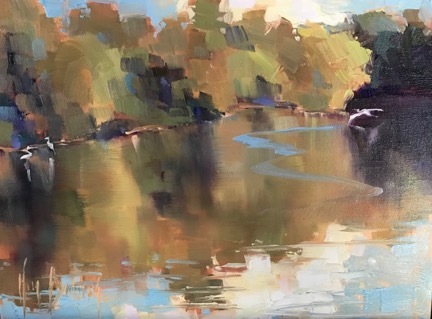 Add the fresh brushwork of plein air to capture light, atmosphere and excitement of the outdoor experience so your paintings capture the mood of the day. 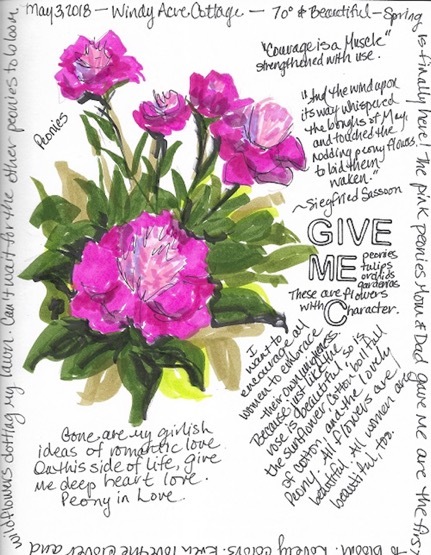 Start by gathering information in sketches in order to experiment with compositions and gather ideas. What inspired you to paint a particular scene? Concentrating on this one idea will help you through the painting process. Learn to break down the landscape into: directional line, positive and negative shape, value relationships, color harmonies, color intensity and edge quality. Understanding each aspect of the landscape painting in this order helps build confident design to convey your idea. 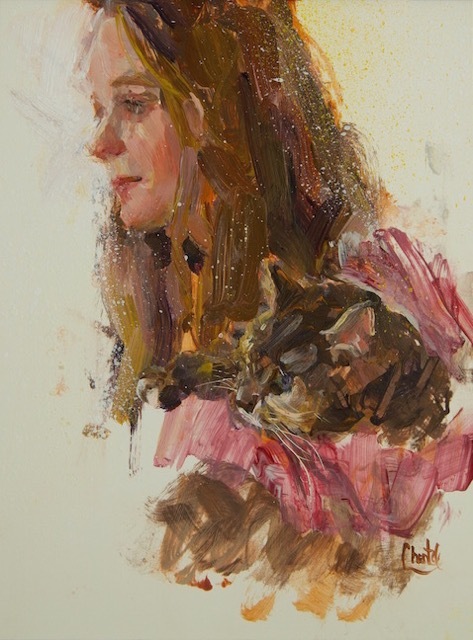 Kay will offer demos in both compositional sketches and oil, and lots of individual encouragement at the easel. Lunch will be a time to gather to share our ideas and paintings. Supply list: Please bring what supplies you are comfortable with and confident using. trash bags, sunscreen, water, brush washer with Gamsol, Odorless mineral spirits suggested No paper palettes, please. Description: The first part of the day, there will be a slide presentation and handouts that will help the artist interpret value more clearly. Value and composition exercises and studies to be painted by each participant, from provided photo reference or image projected on screen. You are invited to eat lunch at the studio provided my me…Soup and salad. 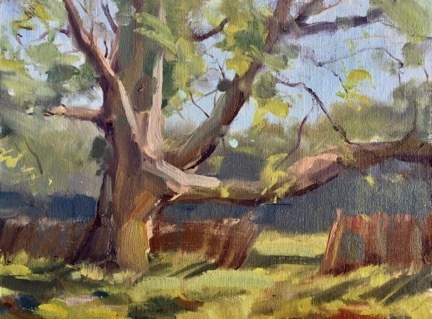 The second half of the day, we will paint value sketches “en plein air” at On Track Studios. I’ll also have some small panels for you to use…We will keep it small on this day! Description: Have you ever taken a walk in a spring meadow or ridden your bike on a country lane or any other outdoor experience that was so beautiful you wanted to capture it to savor at any time? The sights, sounds, and feelings of nature are awe-inspiring, and what could be lovelier than to preserve the moments of inspiration in a nature and travel journal? Thomas Jefferson, Meriwether Lewis, Thomas Edison, Charles Darwin, Ralph Waldo Emerson, Henry David Thoreau, and Prince Charles are just a few who journaled, who kept nature- and travel-themed notebooks. Peter Rabbit and all his furry friends were characters that emerged from Beatrix Potter’s nature journals. Signups are on a first-come, first-serve basis and you may take as many workshops as you like. There will be no fall series offered this year, so sign up now. The Chestnut Group website will process all registrations and payments securing your spot in the class. Checks are not an optional form of payment. To get the discounted member rate, you must be logged in to the website. After registration, you will get a confirmation email from the site. Class purchases will also show up on your My Workshops page after processing is complete. Dues must be current to signup at a member discount. If you have any trouble with logging into the website to access the signup form, or renew, reach out to Wendy Ervin at 615-826-7421 or Renee Bates, 615-642-3007 for assistance. Be sure you are logged in to the Chestnut Group website for your member pricing.